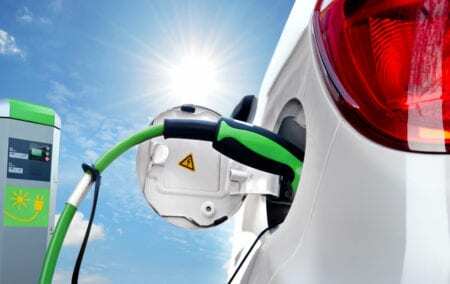 Home > Blog> Electric Car or Hybrid Car? Electric Car or Hybrid Car? It’s 2017. It’s fairly commonplace to see an electric car or hybrid car humming around the Beltway. And in this new era of car-buying and energy efficiency, you might be wondering which one is right for you. Before we go into the pros and cons, let’s analyze the difference between an Electric Vehicle (EV) and a Hybrid Vehicle (HV). HVs are a hybrid of electric and gasoline-powered engines. There are actually two kinds of hybrids: a Traditional Hybrid Electric Vehicle (HEV) and a Plug-in Hybrid Electric Vehicle (PHEV). HEVs use electric power at low speeds, but switch to gasoline power when more speed is needed. Both systems will work simultaneously if even more power is needed, such as on a steep hill. Gasoline is still the main fuel of HEVs, but they use a lot less gas than traditional internal combustion engine vehicles, because the batteries charge whenever the driver uses the brakes. The most popular model is the Toyota Prius Hybrid, which gets about 56 MPG and has a range of over 600 miles on one tank of gas. PHEVs use the electric motor until the battery reaches a predetermined level of charge. When that level is reached, the gasoline engine is used to extend the vehicle’s range. The electricity used by these cars comes from the electric grid, rather than from braking. PHEVs offer much greater energy savings than HEVs. Popular models are the Chevrolet Volt and Cadillac ELR. The primary advantage of both HEVs and PHEVs is range, as described above, because HVs use gasoline engines in addition to their electric powertrains. The result is that HV drivers get the best of both worlds: electric-vehicle efficiency around town, and traditional car range for longer trips. EVs, in contrast, are fully electric cars. The Nissan Leaf and Tesla Model S are popular examples. Since there is no gas tank at all, there is more room for batteries, therefore letting you travel a longer distance on electricity alone than with a hybrid. Electric vehicles offer several advantages over plug-in hybrids. The main attraction is that electric vehicles benefit the environment more than hybrid vehicles, since they don’t use any fuel at all (other than that used to produce the electricity). That’s a big deal for shoppers looking to minimize their carbon footprint as much as possible. EVs use less than half a barrel of oil per year, and have no tailpipe emissions. Even when you factor in the fuel used at power plants that power EVs, they still pollute less than HVs and standard gasoline-powered cars. For the same reason, electric vehicles help drivers save more money than plug-in hybrids do: for instance, the fuel efficiency of a Hyundai Ioniq Electric is 136 MPG equivalent, whereas HV version of the Ioniq gets 58 MPG. They also offer a longer electric-only range than plug-in hybrids: the Leaf’s range is about 84 miles. That means drivers who want to cruise for as long as possible without using a drop of fuel will be better served with an EV than a plug-in. Of course, there are some drawbacks to EVs. By far the largest drawback is that their range can’t yet match that of a gasoline-powered vehicle. While a plug-in hybrid can usually travel around 50 miles on fully electric power and an extra 300 or so miles on gasoline, most electric vehicles are limited to 60 to 70 miles of total range, though the top range of the Hyundai Ioniq is 124 miles. That means drivers with a long commute, or those who routinely travel more than 60 to 70 miles without overnight stops, would be wise to consider a HV instead of an EV. An exception is the Tesla Model S, which can travel over 200 miles between charges. The Model S still doesn’t have the range of most HVs, however, or the ability to refuel as quickly. The Model S also retails for around $70,000, putting it out of the price range of most car buyers. Why do you want a hybrid or electric vehicle? If your main purpose for buying a new car with a fuel-efficient focus is gas-pump savings and tax rebates, don’t worry: Both HVs and EVs will benefit you. While hybrids still need to be filled with gas occasionally, fuel costs are still much lower than those of traditional cars: all but the least efficient hybrids offer annual fuel costs of about half what you’d spend with a standard gasoline-burning vehicle. Just as importantly, federal income tax rebates apply to both HVs and EVs, as do most state tax credits. Even states that allow alternative-fuel carpool use tend to allow both HVs and EVs. In other words, you won’t go wrong when choosing an EV or HV; you’ll just have to choose the one that works best for your situation. Retail prices for HEVs and PHEVs are around $24,000 for a Prius Hybrid to $46,000 for a BMW Plug-in Hybrid. The price range for EVs goes from about $30,000 for a Nissan leaf to as much as $112,000 for a Tesla Model S.
The website fueleconomy.gov allows visitors to search by MPG, price, model, etc., rates vehicles by fuel economy, lists tax credits available for different vehicles, and allows side-by-side comparisons.